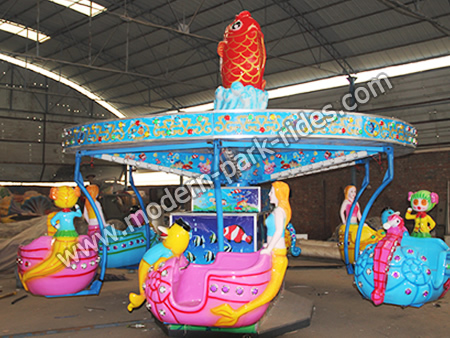 Ocean walking amusement ride is a kind of new kiddie amusement equipment. It is designed according to the samba balloon ride and the swing chair ride and belongs to the rotary rides. It adopt the mysterious sea as its theme or we can say background, use the dolphin, conch, hippopotamus and the beautiful mermaid as its decorations, this kind of appearance is attractive to kids. Ocean walk has been a new attraction in the kiddie amusement park once has been designed out as a kind of symbolic rotary ride.